Call 1-214-564-1407 to place an order. Click on each image to enlarge to see sample of the intricate detail and decor. Adorable soft sculpt rabbit pillows. 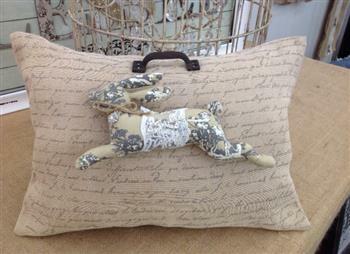 A toile/lace rabbit on a French writing pillow. The rabbits are 9.5" embellished with lace and rhinestones. Pillows are 12x18. Pillows are jute cotton.